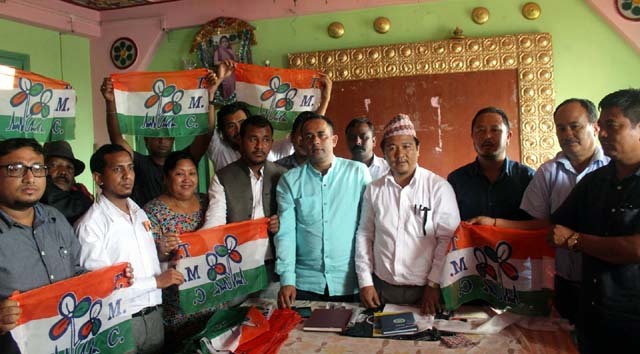 Mukesh Sharma, Kalimpong: Leadership of Trinamul Congress in Darjeeling Hills has decided to contest all four- municipality elections.Keeping an eye on civic body election, which is scheduled to be held by the end of this year, the leadership has decided to revive its organization in the Hills. “We will decide later if any party wants to form an alliance with us they will have to talk to our party high command,” he added. According to him a core committee meeting will be held in Darjeeling to discuss and formulate strategies to take on ruling political parties in civic polls. Several members belonging to Biswakarma community under the leadership of its President Yakin Lamichame joined the party.